Here we come to the origin of one of the most successful Microsoft Office productivity features – Mail Merge, in Word 2003 – an equally one of the most successful and popular Office installments by a wide margin. Mail Merge in Word took an impressive start by appearing on this platform after its birthplace – Word 2002 (of ‘Office XP’, released in 2001). Office 2003 is now officially no longer supported by its parent, but, despite this fact, and despite it being somewhat outdated (in comparison to the more modern Microsoft Office installments released over the years) both interface-, security- and feature-wise, many people who still own the license use it and prefer it over the rest of the ‘Office’ family. For these people, and professionals who have to use the feature in Word 2003 over the line of duty, we will explain how to use the Mail Merge in MS Word 2003, thus continuing our series of articles which describe the Word Mail Merge feature. The core feature of Mail Merge – a mailing productivity tool, which allows to greatly improve the way people communicate via email using massive known recipients base, which is its impressive trademark personalization and automation ability – remains on this platform with little change. The Word Mail Merge allows to send each recipient a personalized copy of the letter formed from a single Word document, which is composed using the main text in its body, and the special Macros – a value placeholder, which extracts any individual detail about a recipient (from the Outlook Contacts storage or an external data-source pre-populated by hand) and replaces the Macro code with the actual value – a First or Second Name, Business or Home address, date, time or amount – anything could be used to personalized the letter to achieve a lot more in regards to the quality of a mailing with less time. However, due to the major differences in regards to the user interface between Word 2003 and later Word editions, one must take a somewhat different approach to performing his/her mailing – we will describe all the steps a minute. The main difference here, of course, is the introduction of the now-trademark ‘Ribbon’ interface in all subsequent editions of Office. Thus, the option required to initiate a Mail Merge, Word 2003 accommodates quite differently. In order to access the Mail Merge Wizard, you will need to navigate to Tools > Letters and Mailing > Mail Merge. 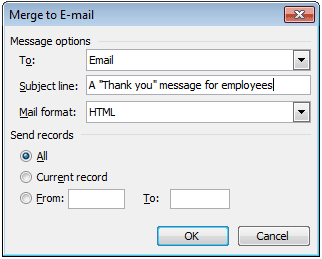 You can also enable the “Show Mail Merge Toolbar” so that the mailing could be controlled manually. There you will see a familiar 6-step wizard allowing you to conveniently compose your mailing from scratch. Enabling the toolbar will allow you to easily insert your customized Greeting Line, for instance. To surpass this and other limitations, we have created an add-in called Mail Merge Toolkit. It is a massive extension for many native features; for instance, while Mail Merge in Word 2003 only allows a single attached file to be sent to all recipients, the add-in enables you to specify individual attachments and a way to specify whether a recipient will receive an attachment at all. Its benefits are explained more thoroughly in, for example, the following article – “Mail merge with attachments in Outlook”.